Do the lost gold mines of Byzantium exist? Joshua asks if the Rus contributed to the economic rise of Byzantium in the 9th and 10th centuries. 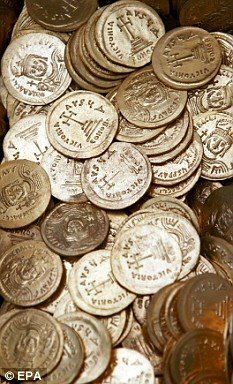 One of the great mysteries in Byzantine history is where exactly the empire got its wealth in the 9th century. As early as the reign of Justinian it was chronically short of funds and even sensible attempts to cut costs got more than one emperor dethroned. By the 8th century Byzantium was clearly heading towards a financial collapse. Plagues and wars had crippled the economy reducing some areas to the barter system and the Islamic invasions had stripped away its most profitable territories. But as the 9th century rolled around, instead of bankruptcy, the imperial treasury started flinging gold around like it was going out of style. The emperor Theophilus (829-842) built a grand new throne room complete with golden throne, golden lion statues (who could roar at the pull of a lever), and a golden, jewel encrusted tree complete with mechanical birds. When it came time to conclude a truce with the Saracens, he offered 100,000 gold coins- then to impress the Caliph he had his diplomats scatter 36,000 more in the streets of Baghdad. So where did all this wealth come from? The traditional answer is that new gold mines were discovered- the fabled lost mines of Theophilus. Even though no surviving records mention any such thing, it could certainly be true- mining is a rather dull activity to report on and we have relatively few contemporary sources. But I think there is a case to be made that the Black Sea trade was able to offset the loss of Egypt and North Africa. The problem is that the Byzantines are frustratingly quiet when it comes to the Rus. Going by Constantinople you would hardly even know they had any dealings with the Russians at all. In the Greek sources there is a grand total of one mention of trade with the Rus- Leo the Deacon reported that in 971 they demanded increased trading rights in exchange for peace. Fortunately for us the Russians kept records- The Russian Primary Chronicle- and it reveals a rich exchange. The general pattern was for the Rus to attack every time they wanted to renegotiate a treaty. In 907, 945, 971, and 988 Constantinople was attacked to force an increase in rights. By the end of the 10th century Rus merchants could stay inside the city for 6 months (instead of the traditional 3) during which time they were given free board, access to baths, and a small stipend courtesy of the emperor. The main value of the Rus was not what they could directly supply- mostly wax, furs, and slaves- it was their access to the lucrative trade routes through Central Asia, Iran, and Mesopotamia via the Don and Volga rivers. During periods of hostility between the empire and the Caliphate, Asian goods (glassworks and silks) could still reach Constantinople via the Black Sea- during the peak times in Spring and Summer a ship could cross from the Crimea to the Hellespont in 24 hours. Imperial tax collectors took a ten percent toll of everything that entered Constantinople, a massive economic windfall that showed no sign of slowing for several centuries. No wonder the Byzantines were so reluctant to concede more privileges to the Rus without a war- or to discuss it afterwards!